Originally published in Volume Eight. Because we experience architecture every day, both physically and visually, the impact the discipline has on people’s quality of life is tremendous, yet subtle and often overlooked. Ultimately, how architecture is perceived is not only how buildings look, but also how the life inside, around and in-between buildings is organized. How do we circulate? Where do we meet? Where are the public and private spaces? These questions are addressed in the early stages of the long process that is architecture. Although many architects see this as a crucial phase in the design process, the qualities drawn from this creative thinking are hardly commented on and appreciated by the general public, whose consideration goes mostly to the facade, its expression and aesthetics. Over the last fifteen years, in Norway and particularly Oslo, architecture has become more and more a part of the public debate and is written about in general media outlets. The sudden resurgence of interest in architecture probably came with the rise of the Oslo Opera House in 2008, iconically designed by Snøhetta. And later, with Barcode, Oslo’s first skyline, the area of Bjørvika is now one of the most relevant in Oslo’s architecture. Dark Architects is one of the offices deeply involved in this new part of the town, drawing buildings and working on urban development. Øivind Breen, Ingrid Marie Martinsen and Gerhard Linder, respectively C.E.O, architect and partner at Dark Architects, discussed what goes on between the earliest stages of the process and the construction of the area. This includes regulations, clients, creative processes, environment issues and how architecture is chiefly about solving problems. Buildings are usually not to be moved, hence are built in a place, for a place and its surroundings. They live long. 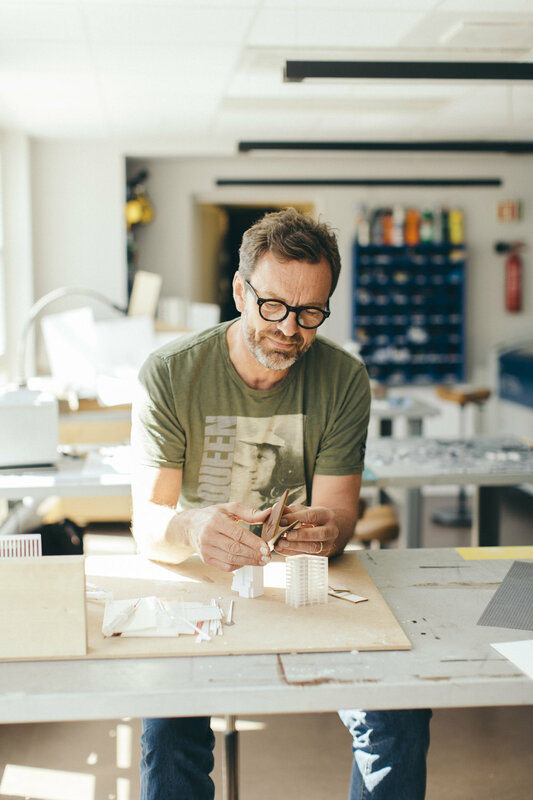 When asked about how one starts a job, Øivind emphasizes the importance of considering the site when designing. "Are we in the countryside or in the middle of the city? The environment is the first thing we look at," explains Øivind. "From the sun’s trajectories in the different seasons, to climate and the geological characteristics of the plot. There are three perspectives that we analyse thoroughly: what are the interests and the ambitions of the developer, what is the impact of the project on society, the environment and the users. Limits and regulations are more often than not at stake when designing, but it gives a strict framework that forces us to engage more, be more creative and resourceful." An important part of the job then, is about defining problems that were not presented as problems by the developer, and come up with answers. "Before the drawing process even starts, it’s important to have articulated ambitions," continues Øivind. "After volume studies, it’s time for the client to get involved, and react to, for example, three proposals that we make very different from each other. I like when the clients have ideas and expectations; it gives us things to work with and we like the dialogue." "Very often, the general public only considers and evaluates architecture by how it looks from the outside, the facades, which are often an expression of compromises, finances, regulations and environment," says Øivind. "We always look for the possibility to do something creative—it can be small things not necessarily related to the expression of a building. We look into innovation within environmental aspects, construction, programming… There are a lot of challenges that appeal to creativity and creative thinking beyond the shape of the building." A good example is the newly built Oslo Cancer Cluster Innovation park. It is a place that shelters both a high school and a cancer research center. The ambition of the project was to create an environment where pupils and researchers interact, where students benefit from being so close to scientific research, participating in experiences and being in an uplifting environment. Gerhard Linder was project manager for the projects, and remembers the challenge well. "The main topic we addressed was how to make architecture that can facilitate people with different backgrounds to meet and interact. How can these two groups live in the same building? The researchers could not be restrained to their own corridors, living in a detached universe from the school. Apart from the meeting places, a challenging part of the program was making versatile spaces and rooms—even though the researchers were theoretically not supposed to be part of the school, we wanted to create a good possibility for them to use it," says Gerhard. "So the auditorium was made accessible to the researchers, and the big multipurpose hall can easily be turned into a conference room for a thousand people. Spaces that could benefit both groups is an important answer to the challenges raised by the ambition of the developers." Architecture has to answer something. It’s not something that just happens. Things are done a certain way and it is important to know why. The challenges are manifold—different users with different needs, sites, legal requirements, even neighbors who are afraid of change. But the constraints force architects to try new approaches, think differently. Hence, challenges are not necessarily obstacles. Every problem and solution adds to the design a new layer of information and consideration, ultimately working towards a constructed environment suited for many users.